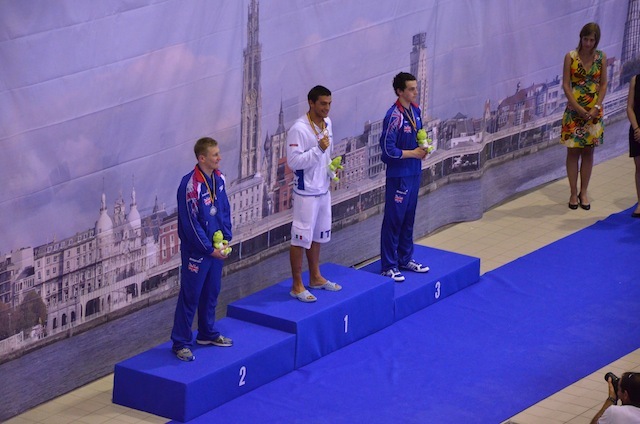 After two days of racing at the Antwerp 2012 European Junior Championships, Russia’s youngsters are dominating the event with 7 gold medals and 1 silver (out of 14 gold possible till now), ahead of Italy’s 3 gold, 1 silver and 2 bronze, and Germany’s 1 gold, 4 silver and 2 bronze. Most winning swimmers are Russia’s Iuliia Larina and Italy’s Gabriele Detti, having won 2 gold medals each. And Italy’s Diletta Carli took down East Germany’s Heidi Grein’s 400 freestyle European Junior Championships record from 1986. Russia’s Andrei Shabashov took the gold in 55.24 and 831 FINA points ahead of Italy’s favorites Fabio Laugeni in 55.31 (827 FINA points) and Niccolo’ Bonacchi in 55.63 (813 FINA points), Shabashov ranked third with a time of 56.08 on the entry list before clocking 56.72 and 6th in the prelims and then 56.15 and 3rd in the semifinal. Favorite Diletta Carli from Italy took the gold in a new championship record of 4:09.36 and 882 FINA points, the old record former East Germany’s Heidi Grein’s 4:10.54 from 1986. Russia’s Ksenia Yuskova was second in 4:12.28 (851 FINA points) while Camille Gheorghiu secured France its first medal on these championships, bronze in 4:12.64 and 848 FINA points. Favorite Liliana Szilagyi cruised through the prelims with a time of 2:15.48, her entry time 2:10.95, before posting 2:13.66 and fastest in the semifinal and then the winning time of 2:10.53 in the final. Germany’s Elena Czeschner won silver in 2:12.10 and Rosalie Kaethner bronze in 2:14:45. 4th ranked Mariya Baklakova from Russia took lead in the prelims with a time of 56.07 before posting 55.68 in the semifinal, yesterday evening, 55.08 and 844 FINA points in the final, a clear improvement from her entry time of 55.94. Favorite Anna-Stephanie Dietterle from Germany’s took the silver in 55:42 (829 FINA points) and Great Britain’s Amelia Maughan the bronze in 55.64 (819 FINA points). Baklakova and Dietterle both in 1997, so we might well see this duel again next year. Favorites Marat Amaltdinov (RUS) and Ross Murdoch (GBR) dueled their way to the final, the Russian best on paper with an entry time of 2:12.38 to Murdoch’s 2:13.63, Murdoch taking the lead in the prelims with a time of 2:15.14 to Amaltdinov’s 2:15.68 and then the semifinal in 2:13.62 to the Russian’s 2:15.18, Amaltdinov then taking charge the final with a time of 2:13.15 to Murdoch’s 2:14.53. Our friend Irakli Bolkvadze from Georgia took the bronze medal in 2:15.46, a new national record bettering his 2:16.35 from the Debrecen 2012 Europeans and first European junior medal for Georgia since they became independent in 1992. Russia’s Iuliia Larina took her 2nd gold medal at these championships with a time of 2:11.07, Ukraine’s Iryna Glavnyk 2nd and silver in 2:12.87 and Italy’s Ambra Esposito third in 2:14.45. Larina was ranked highest on the entry list, but battled with Spain’s Lara Brenda Makin Lopez in the prelims and semifinal yesterday, before Makin Lopez for some reason faded to a 5th place in the final. Italy’s Gabriele Detti won in 15:11.41 and 882 FINA points, an impressive time if his compatriot also born 1994 Gregorio Paltrinieri had not managed a time of 14:48.92 at the Debecen 2012. With Paltrinieri now busy preparing for the London Olympics, Germany’s Rob Muffels took silver in 15:18.82 (861 FINA points) and Spain’s Antonio Arroyo Perez bronze in 15:21.89 (852 FINA points). Russia took the gold easily in 3:43.12 ahead of Great Britain’s 3:45.18 and the Netherlands’ 3:45.51. Great Britain had posted best time in the prelims with the Netherlands in second and Sweden in third, but Russia had saved Mariya Baklakova and Ksenia Yuskova then, Baklakova managing another scorching time of 55.27 as first swimmer for the team in the final, with Yuskova anchoring in 55.66.